What Do Clients Value When Hiring a Consultant? For professional services firms, knowing what clients value in a consulting firm—and crafting the message accordingly—can be the difference between winning and losing an engagement. To that end, APQC asked senior procurement and C-level executives to prioritize what they value when hiring a consultant and the takeaways couldn’t be clearer. 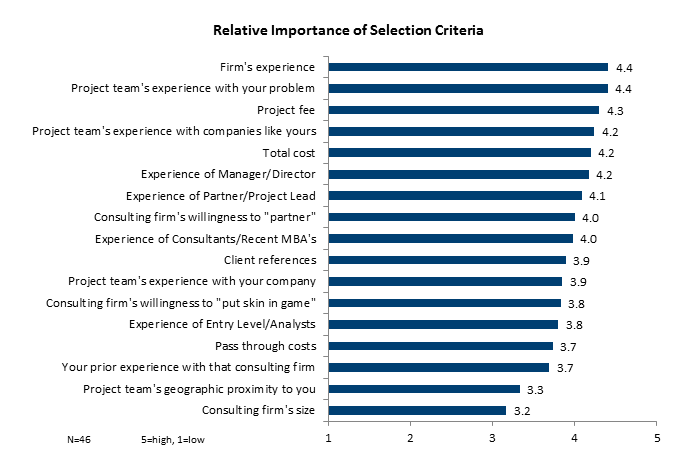 Of the 17 criteria evaluated in APQC’s survey, five of the top seven issues were variations on experience: the firm’s experience, the team’s experience, the experience of the senior team members, etc. And it’s the combination of experiences that are key. Simply saying the firm has done this kind of work before may not be enough. Prospective clients aren’t hiring the firm; they’re hiring the best team. They want to know who will work on the project and their individual experience on projects like this. The project fee and total cost (including pass-through costs) are collectively the second most important thing clients prioritize. While clients have always been price sensitive, the prioritization is higher than expected. When I’ve conducted client interviews over the last ten years, the consensus was usually, “As long as a firm’s fee is in the ball park of their competitors, the fee doesn’t matter much.” What we see today represents a significant shift in mindset. In part, it’s a reflection of the increased role of procurement in purchasing consulting services. But I think it’s also a reflection that consulting is all too often being seen by clients as an undifferentiated commodity – the value of which can be compared on an apples-to-apples basis to a competing bid. If two firms are pitching a similar “solution,” or the client can’t really tell the difference in value between the two offerings, then it can’t really be surprising that cost will become a crucial determining factor. While experience and price are paramount decision factors, they are difficult areas to differentiate. Does it matter that you’ve been doing this work for 20 years and your competitors have only being focused on this area for 19 years? There comes a point where you both are experts. And once two firms say they’ll match or beat anyone else’s price, that conversation becomes null. If you stand behind your work, why not put 100 percent of your fee at risk? Why not align your fee with the client’s outcome (e.g., as a percentage of the savings found by reworking a client’s supply chain) as opposed to a calculation based on your fixed costs plus margin? Why not accept stock options in a start-up instead of cash, if you truly believe in their business? Why not align your fees with the exact same metrics that the CEO’s bonus is tied to? If you push past the initial defensive bravado, the core answer to those questions is usually: “we don’t trust our clients to implement our advice correctly” or “we don’t want to take on the risk that the project may fail.” Now put yourself in the clients’ shoes: their business, and certainly their jobs, are at risk if the engagement doesn’t meet its goals. How much more comforting would it be—and therefore, how much more attractive would your offer be—if you could promise to be there for the whole undertaking, not just your project? How much more likely would you be to win the work if the client knows that you won’t turn a profit until they do? This all makes great sense! I often felt that we had spend too much time producing posh / glossy materials that relied on boiler plate powerpoint slides.